Gyoza - Gyozas are Japanese dumplings with moist and juicy ground pork and vegetable filling. They are pan-fried to crispy golden brown on the outside. Learn how to make gyoza with this quick & easy recipe that takes only 30 minutes. Gyozas are Japanese-style dumplings. 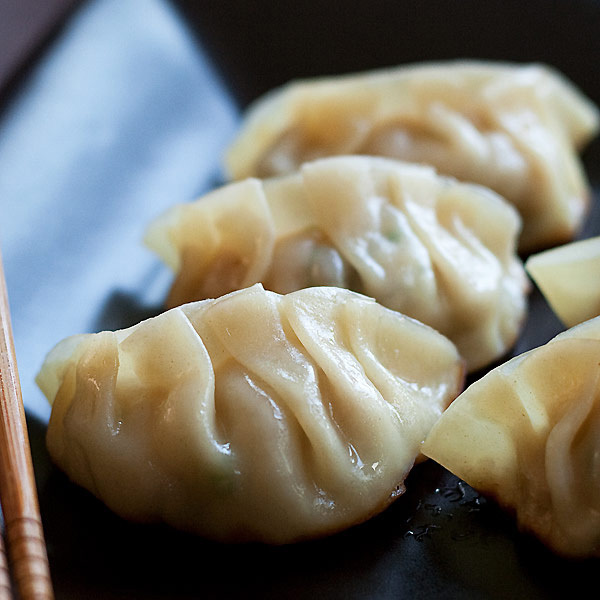 Originated from Chinese jiaozi (dumplings), gyoza has become a mainstay of Japanese cuisine, a staple that is very popular in and outside of Japan. In the United States, you can find gyoza at Japanese restaurants and Asian-themed restaurants. There are four ways of preparing gyoza: steamed, boiled, deep-fried, and pan-fried. I am especially partial to pan-fried gyoza, or yaki-gyoza. It’s hard not to like yaki-gyoza—tiny parcel of juicy filling encased in a dumpling wrapper, pan-fried to crispy golden brown at the bottom, and then lightly steamed to create the nice contrast in mouth feel and texture. The highlight of gyoza lies in the exceptional and flavor-enhancing ponzu dipping sauce, which compliments and completes the taste. Gyoza can be served as is without any dipping sauce, but commonly, a Ponzu dipping sauce is served with them. I personally like my Gyoza sauce to be aromatic so I always add some sesame oil with the Ponzu sauce. Other than that, you can also add some sliced ginger strips with the sauce. Making gyoza can be challenging to many people if you don’t know how to assemble or wrap the dumpling. Above is the step-by-step picture guide. First, you place the filling in the middle of the gyoza wrapper. Some regular food stores also carry the wrapper. Secondly, you add water around the outer edges of the gyoza and fold it up into a half moon shape. Thirdly, you form pleats and seal the wrapper tight. Please take note that practice makes perfect when it comes to making homemade gyoza and wrapping them. so get yourself all the ingredients in this gyoza recipe and start making gyozas at home. I will assure you that it’s easier than it appears to be. Gyoza Recipe - Gyoza are Japanese dumplings. Learn how to make the best gyoza with this quick & easy recipe that takes only 30 minutes. In a bowl, combine all the ingredients in the Filling and blend well. The Filling should be sticky and cohesive. 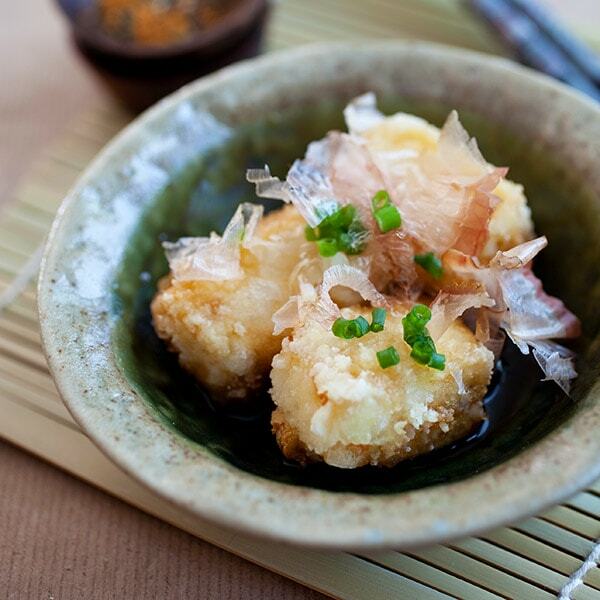 In a dipping bowl, combine the Ponzu with the sesame oil. Stir to blend well. To assemble the gyoza, place a piece of the gyoza wrapper on your palm or a flat surface. Spoon about 1 teaspoon of the Filling onto the center of the wrapper. Dip your index finger into some water and moisten the outer edges of the dumpling wrapper. Fold the gyoza over, press and seal the left end. Use your thumb and index finger to make a pleat. Pinch to secure tightly. Repeat the same to make the pleats. (Start with 3-4 pleats if you are a beginner). A nicely wrapped gyoza should have a crescent shape. Heat up the oil in a skillet or stir-fry pan over medium heat. Arrange the gyoza and cover with the lid. Pan-fry the gyoza until the bottoms turn golden brown and become crispy. Add about 1/4-inch water into the skillet or stir-fry pan and cover the lid immediately. The water should evaporate after a few minutes. Continue to cook the gyoza for a couple of minutes to crisp up the bottoms. Remove the gyoza from the skillet or stir-fry pan and serve immediately with the Ponzu dipping sauce. To grate the ginger and garlic, you can use a Japanese grater (oroshigane) or Microplane. Get a good gyoza wrapper. Gyoza wrapper is generally thicker compared to other dumpling wrapper. Most of them are round in shape, but some are oval-shaped. For easier assembling, I suggest the round-shaped gyoza wrapper. 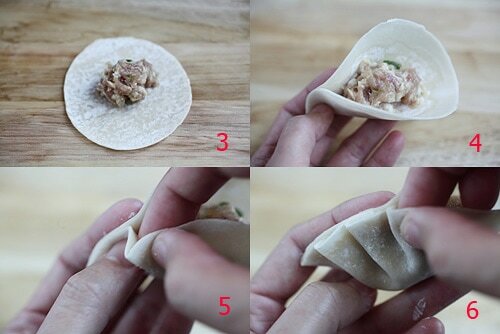 If you can't find gyoza wrapper, you can always use pot sticker wrapper, or Chinese jiaozi wrapper. Traditionally, Japanese home cooks use their hands to mix the gyoza filling for the best texture. You can adapt this recipe and make vegetarian gyoza. All photos and recipes on Rasa Malaysia are copyright protected. Please do not use the photos and recipes without prior written permission. If you wish to republish this recipe, please rewrite the recipe in your own words instead of copy and paste and link back to //rasamalaysia.com/gyoza-recipe/. Thank you very much! Kiran, now you can try it out. Great gyoza recipe. What a great idea to use the soup base to season the Gyoza filling. Never thought about that but can imagine the umami taste. Ken, Mizkan (Bonito-Flavored) Soup Base is a magical condiment. You can use it for many recipes! Great recipe Bee! I loved your salmon teriyaki recipe. 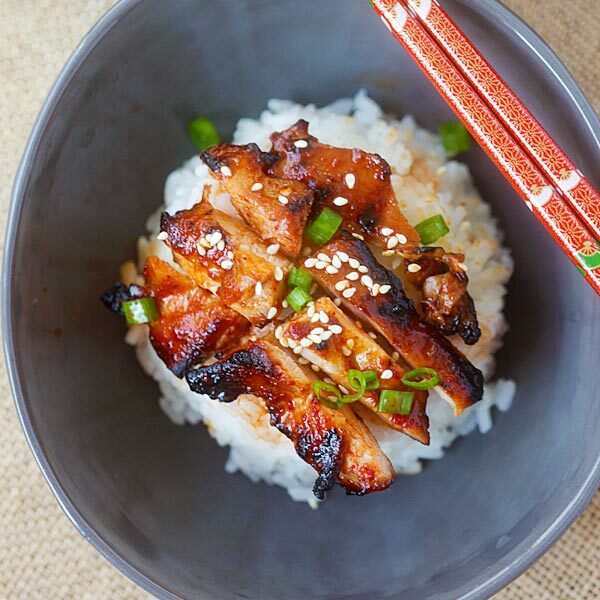 I use your teriyaki sauce fir everything now, my kids and husband love your food and recipes. Thanks. Thanks Shirley, I am happy that you love my recipes. You have to try this gyoza recipe, it’s great. I’m intrigued by the soup base. Is it the same as the one used for cold soba? Correct, Mizkan (Bonito-Flavored) Soup Base can be used for a variety of dishes–soba, udon, somen, tempura, dumpling, etc. I am a Chinese and live Chinese jiaozi but have to say that ponzu makes a great dipping sauce for all dumplings. My, your dumpling folds are perfect! I bow down at great gyoza folders. I am humbled…and hungry for dumplings now! I have made so Many gyoza, but yours still look better. 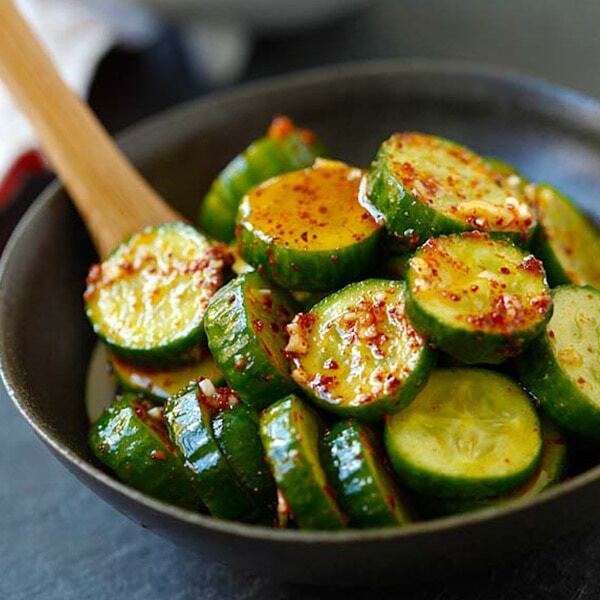 I like a little heat in my dipping sauce so I soak some facing heavens chilies in the ponzu sauce. Makes for an interesting twist. Great idea. Happy that you like my gyoza recipe. Looks yummy! Something for me to try out this weekend! I have to look for the Bonito soup base though. What else can you use it for? Ha.. finally, now I know how to fold those things. Thanks for that. I love gyoza, my favourite japanese dumpling. dumplings are one of my fav and I can never get bored of them. My fav is momo which is a different kind of steam dumplings. This one tempting me a lot. i would love to try this. have a quick question though. Could i make the same with thin wanton wrapper ? OMG!! I am rushing out to get all the ingredients I’m able so I can make these SOON! They sound mouth watering. Now to find the mizkan…. I love gyoza and have never made them! I love your recipe and step-by-step photos. Thanks! Thanks Katherine, I hope you get to try this Gyoza recipe. I loved this post and your website. Such breathtaking photographs! Expecting that you’ll also have a look at my curry blog. Happy cooking!! Thanks for the gyoza’s recipe, i’ll make it soon!!! Thanks for you website too, best recipes site!!!! Thanks, Bee. I made gyoza last night and my little boy wants more. I ran out of wrappers and would like to make wrappers from scratch! Searching through your site. Now I’m missing my time living in Tokyo – stopping at some tiny shop at Shinjuku station, dropping a few coins in the machine, grabbing the receipt and trading the cook for a plate of hot gyoza. Tokyo is truly the city of vending machines. I am really interested in making these dumplings. However I’m not sure I can find the soup base or the ponzu. What do you suggest I use instead of those ingredients? They look delicious. If not, just use soy sauce and dark vinegar. I’m hardly a cook, but these turned out ~90% restaraunt qual. Same recipe was printed on back of gyoza wrappers pkg. couldn’t find the bonito soup base, got a different flavor… instead of ground pork, i chopped up rib meat… also added red pepp flakes to filling. turned out great! thanks for publishing this with these nice photos! I tend to make a mess when the water goes in cos the hot oil splashes out. Of course I quickly cover the lid otherwise I get burned. Is there another way? Sounds like a great idea. I love it. These gyoza are so good! I have a question though, I put some in the freezer and now I’m not sure how to cook them. Do you just put them in the pan on medium heat and cook just like fresh ones? I’ve been cutting down on meats for ethical purposes and added more fresh veggies from my local supermarket. I chose to do this for ethical and environmental purposes because meat takes longer to grow than vegetables. This recipe still tastes just as good! Do I cook the pork before I mix the filling or do I let the pork cook in the gyoza when I fry it? I had the most amazing dumplings at a pop up restaurant in Brixton, London during the summer and have been craving them ever since. I have decided to make my own now and done hours of research and am going to try your recipe. All the unusual ingredients I have ordered from the Japan Centre in London and will let you know how it goes. Thanks Dom, I am sure you will like my gyoza recipe. I’m reading through the comments and people mention a soup base to flavor the filling. I don’t see any mention of soup base in the recipe or the description. I plan on making these tonight and hope they turn out ok. Did the recipe change over the years to not include the soup base?? Yeah, I have changed the recipe and you can just use soy sauce! I tried to do this but I can’t seem to do the wrapping right. It’s so hard to do the wrapping. The skin is hard to close it tight. But the taste is good. Hopefully I can wrap it nicely next time.